Villa Pina Colada is a three storey beach paradise set in the comfort of the Ban Tai Estate on the island of Koh Samui in Thailand. In the villa guests have much to enjoy: they can choose to have a barbecue party or watch a movie on the large terrace. If you fancy some sand and sun, you can walk to Ban Tai Beach. Here at Villa Pina Colada you have all the top-notch services and amenities of the estate at your fingertips. You will feel well taken care of here. Come and have a great tropical getaway with your family and friends here at Villa Pina Colada! There are six spacious, clean, and serene bedrooms that will ensure you get a restful eight hours of sleep. Each bedroom has a bright and spacious en suite bathroom with wooden finishings. Located on the ground floor are two bedrooms. Each of these bedrooms have plush king size double beds and a flatscreen TV with SAT. The only thing distinguishing the two is that the first bedroom opens up to a small yard with a jacuzzi, while the second opens to a connecting private terrace and backyard. From the outside, you can access the next floor where the other four bedrooms are located. The third bedroom has a king size double bed and a private terrace where you can enjoy the silence of the mornings, before everyone wakes up. The fourth bedroom also has a king size double bed and a study area for guests who need to get some work done. The last two bedrooms have private terraces as well. Wherever you decide to sleep, all six bedrooms will have you well rested and ready for the activities of the day. Villa Pina Colada has a lovely manicured garden, with flora and palm trees framing the edges of the villa’s private swimming pool. You can either take a dip in the water or get some sun on one of the two sun loungers by the pool. Across the swimming pool is a nipa gazebo that serves as an outdoor dining area with a freestanding barbecue grill. The dining area comfortably seats six people. It’s the perfect area for evenings when you want to stay in the villa and enjoy good wine and the company of your family and friends. On the topmost floor of the villa is a spacious terrace with a beautiful view of the mountains and greenery beyond. The terrace has two sides. 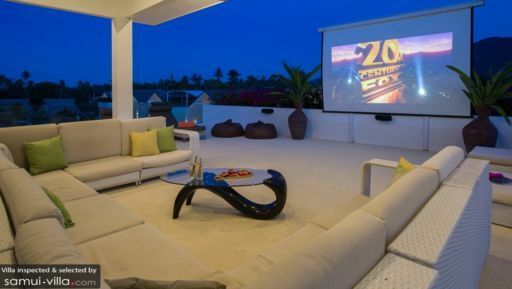 One of them has two large comfortable sofas and a coffee table for placing a bowl of popcorn as you watch a movie on the large projector screen. The other side of the terrace is perfect for enjoying your mornings or afternoons with its jacuzzi and sunbeds. It’s a good spot for lounging and lazing the day away. Villa Pina Colada has multiple open plan living spaces that are designed to bring you peace and harmony. On the ground floor is the lounge, dining, kitchen, and storage area. With white washed walls, wooden furnishings, white accents, and tasteful art pieces, you will definitely feel well rested spending time in these spaces. Overlooking the pool is the six seater dining area that features a gorgeous wooden dining table. Behind which is the fully equipped kitchen and breakfast counter with three comfortable chairs. On the other side of the space is the lounge area with two plush sofas where you can sit back and read a magazine or catch a show or movie on the flat screen TV. On the topmost floor, there is a second living area with glass sliding doors that open up to a view of the surrounding greenery. Here there is a six seater dining area and a leather couch on which guests can also watch TV. The staff here at Villa Pina Colada are committed to making your stay enjoyable and calming. They want you to experience the best of Thai hospitality. There are a variety of services that the staff offer you. There is an on-call concierge service designed to address your needs in the most efficient way possible. Whether it be itinerary arrangements or specifications regarding your room service, the on-call concierge service will happily assist you. 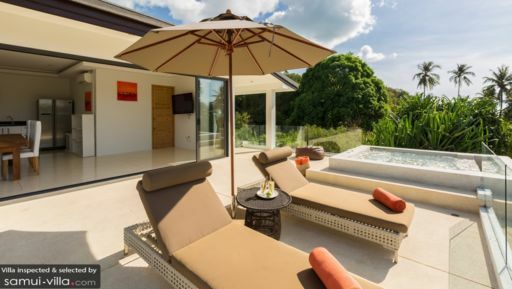 Villa Pina Colada is the perfect getaway for family and friends because of its location in the gorgeous Ban Tai Estate on the island of Koh Samui, Thailand. 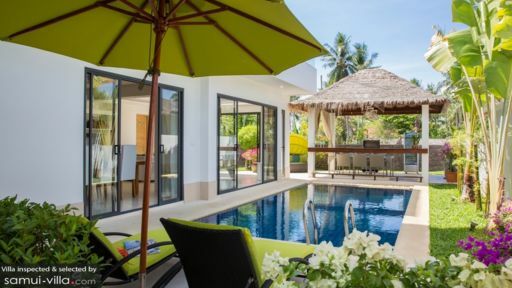 The villa is walking distance from Ban Tai Beach where the whole family can have a fun day under the sun. If you want to explore the island of Koh Samui, there’s also plenty to do on the island. There are various shops and restaurants featuring different cuisines for you to choose from. There are also a number of beach clubs and bars if you want to grab a drink after the sun sets. Near the island is the Angthong National Marine Park where you can explore more of Thailand’s natural resources. Whether it’s a hike, kayaking, or a tour of the park, there’s bound to be something for you to enjoy.